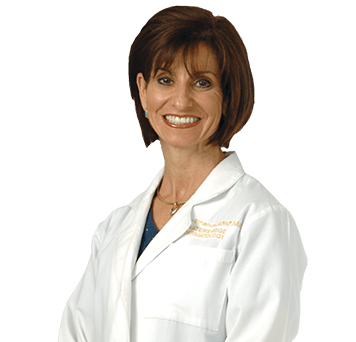 Gerry is a board-certified nurse practitioner and a dermatology-certified nurse practitioner (DCNP). She earned her bachelor of science in nursing from Wagner College in Staten Island, New York, and began her nursing career at Robert Wood Johnson University Hospital in New Brunswick, New Jersey. After moving to Florida, Gerry practiced at Martin Memorial Health Systems in Stuart in various capacities, including ICU, supervising, and outpatient surgery. After receiving a scholarship by Martin Memorial to advance her education, Gerry earned her master of science in nursing and her family nurse practitioner certification from Florida Atlantic University. After losing her father to melanoma, Gerry decided to specialize in dermatology. With several years of prior medical, surgical, and cosmetic dermatology practice, Gerry joined Water’s Edge Dermatology in 2004. She enjoys the autonomy of being a nurse practitioner and appreciates the availability of Dr. Schiff to assist with the more complicated cases. Gerry also enjoys serving as a mentor to other nurses who want to advance their careers. Gerry is a native New Yorker with 3 children, one of whom has plans to follow in her mother’s footsteps.